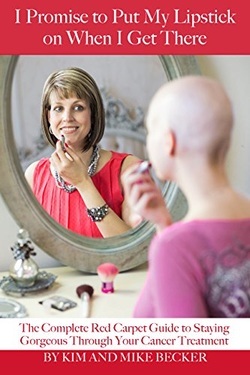 Restoring the beauty that cancer steals. ​woman with cancer at no charge to her. Our Hello Gorgeous Lady is completely surprised when she is brought to FIX salon and there is a red carpet rolled out for her! 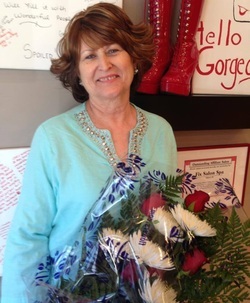 She is handed a beautiful bouquet of flowers from a local florist and a box of chocolates. Our Gorgeous Lady then experiences a facial, pedicure, manicure, makeup, and her hair styled! But that’s not all ~ our Gorgeous Lady puts on a new outfit and is surprised one more time! 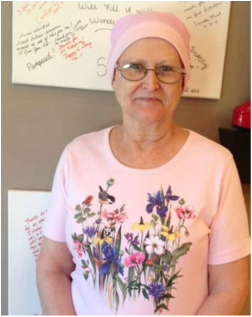 She is taken to The Vine restaurant where friends and family are waiting to greet her and see the big “reveal.” YES – this is very emotional for our Gorgeous Gal and a very touching experience for all of us at FIX salon! FIX salon continues to do these Hello Gorgeous events monthly and we greatly appreciate all tax-deductible donations to offset the expenses. FIX salon does not take any money for the actual services. The costs are for the new outfit, flowers, chocolates, etc. THANK YOU for your contributions. To learn more about contributing, please contact us.